The Red Fox (Vulpes vulpes) is a small canid native to much of North America and Eurasia, as well as northern Africa. It is the most recognizable species of fox and in many areas it is referred to simply as "the fox". It was introduced into Australia in the 19th century. As its name suggests, its fur is predominantly reddish-brown, but there is a naturally occurring grey morph known as the “silver” fox; a strain of domesticated silver fox has been produced from these animals by systematic domestication. The red fox is by far the most widespread and abundant species of fox, found in almost every single habitat in the Northern Hemisphere, from the coastal marshes of United States, to the alpine tundras of Tibetan Plateau. It is capable of co-existing with more specialized species of foxes, such as Arctic fox, in the same habitat. The red fox could withstand and sometimes thrive in areas with heavy human disturbance. It is nowhere near extinction, and its amazing adaptiveness is driving many other less competent species into extinction. A red fox is about three feet long from its nose to the end of its bushy tail, but it only weighs about 10 to 15 pounds . It looks like it should weigh more, but most of that size is fluffy fur. In the wild, red foxes usually only live about 5 years. The gray fox (Urocyon cinereoargenteus) is a mammal of the order Carnivora ranging throughout most of the southern half of North America from southern Canada to northern Venezuela and Colombia. This species and the closely related Island Fox are the only living members of the genus Urocyon, which is considered to be among the most primitive of the living canids. Though it was once the most common fox in the east, human advancement allowed the red fox to become dominant. 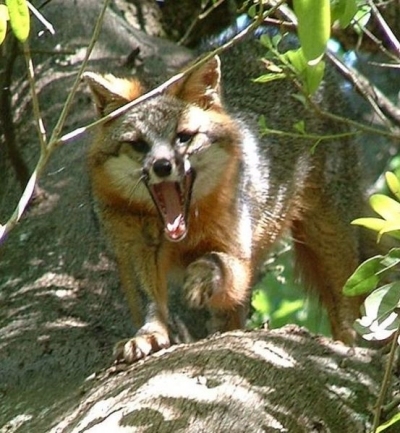 The Pacific States still have the gray fox as a dominant. The gray fox is distinguished from most other canids by its grizzled upper parts, strong neck and black-tipped tail, while the skull can be distinguished from all other North American canids by its widely separated temporal ridges that form a U-shape. There is little sexual dimorphism, save for the males being slightly smaller than females. The gray fox ranges from 31.5 to 41.3 inches in length. It weighs on the average about 10 lbs. It is readily differentiated from the red fox by the lack of "black stockings" that stand out on the latter. The red fox has both positive and negative standing with humans, often being loved or hated. This has been most visible in the United Kingdom where fox hunting with dogs was a traditional sport and an occasional localised means of culling, until this was made illegal in Scotland in August, 2002, and in England and Wales in February, 2005. The fox features in much folklore, usually as a wily villain, though sometimes also as the underdog who triumphs over human efforts to control or destroy it. 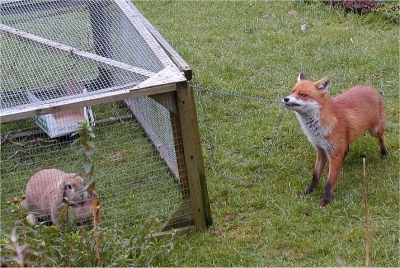 Pheasants, waterfowl, house cats, other game birds, and small game mammals are also preyed upon by foxes. At times, fox predation may be a significant mortality factor for upland and wetland birds, including some endangered species.